Life gets away from us. More than anyone with an uninjured brain, those of us with modified brains can attest to that. Stress and lifestyle have a HUGE negative impact on your body’s neurological function. So, for the injured or atypical brain that is already at risk of overwhelm because of decreased function, the lifestyle details of food and activity and overall psychological wellness are incredibly significant. The main problem being, of course, that anyone with an altered brain is likely less able to attend to these details. It’s a “catch 22” so-to-speak. This has been my life for coming up on 22yrs. Ironic that the number matches up. As I think I’ve mentioned in the blog before, my brain injury causes problems with executive function – that involves the brain’s ability to plan and organize. It’s not that I can’t do those things, it’s more a matter of the quantity of energy it takes to do them. And of course, every day requires that I perform these types of functions in some capacity. So, here I am…having found my rhythm finally, in work, in my social life, and in my home life. I’m saying “no” more often and getting better at communicating my needs, while honoring the needs of those around me. It’s a lot of back and forth, ups and downs, and “trial and error” really. That’s my life. Along these lines, I’ve always struggled with boundaries. Knowing how much is too much or maybe not enough. Because of that, I’ve always struggled with my weight and physical composition (being consistent in any way). That, in turn, plays into my psychological insecurities and social struggles. Having found my stride in my late 20’s, early 30’s, I dropped a ton of weight, and began working on my psychological struggles with a brain injury psychologist. But then I had a series of unfortunate events (one after the other) with work and I lost my momentum altogether (“fell off the wagon”, you might say). During that short time of success, I had been gathering all kinds of helpful knowledge about my health and neurological function. Thanks to those lessons from the brain-injury psychologist, I was aware enough to self-reflect and recognize what was happening to me as I fell further and further away from my healthy routines. The frustrating part, of course, was knowing what I needed to do but not having the energy or emotional strength to do what needed to be done. When it comes to eating healthy and staying active, the ability to plan is essential. “Those who fail to plan, plan to fail” I believe is how they put it. With less time for myself, I’ve had less time for planning and prep, and less cognitive ability to handle my mental and emotional stresses. With high levels of stress comes higher levels of cortisol, and increased “off days” in the eating schedule. In fact, the cheat days become the average or regular occurrence instead of the once in a while “treat” that it started out to be. Hence, the “wheat baby” came back (note the “before picture on the left, below). But, after some time away from the health and wellness world, I am finally stepping back in. I am almost a month into better lifestyle choices and I’m feeling much much better. I am prioritizing my psychological wellbeing, which has given me the strength and emotional focus to create better routines, which in turn sets me up for success in my eating and active lifestyle. I have discovered a healthy eating program that is scientifically proven to improve brain function and to show almost immediate results. And that’s what I’ve been needing for the psychological skill of “Mastery” – which is essentially just the momentum we experience as our brain experiences that feeling of accomplishment. So here it is, folks…my first of the comparison photo series. 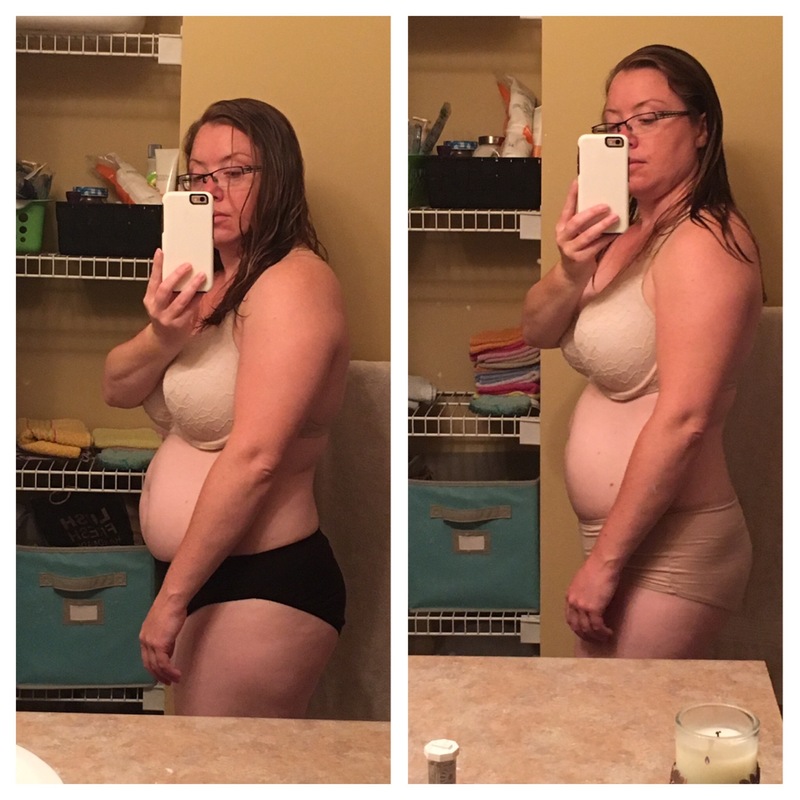 It’s hard to believe, but in both photos I am just standing in a relaxed position – I am not pushing my belly out in any way. This is me after 10 days of following the ketogenic diet (with a few exceptions), drinking more water and less coffee. I will continue to check in here with photos and reflections, as well as tips and tricks that I’m trying. Thanks for following along!